The total number of people born in Bulgaria and living abroad is about 1.1 million, of whom 600 000 to 700 000 left the country for economic reasons. This is according to a policy brief published in October 2017 and authored by Georgi Angelov, Senior Economist, and Marin Lessenski, European Policies Programme Director at the Open Society Institute – Sofia. According to the study, in the past 30 years the largest number of people left Bulgaria at the end of the 1980s and during the crisis-ridden 1990s, but since then, migration out of the country has decreased substantially. The 1980s departures were the migration out of Bulgaria of citizens of Turkish ethnicity, who left following the communist regime’s brutal campaign to force them to adopt Slavonic names. The study noted that Bulgaria’s membership of the EU makes possible visa-free travel to about 150 countries and free access to the EU labour market. “However, there is no increase of those leaving the country after the beginning of EU membership, but rather legalization of those who have already left”. About 35 000 Bulgarians returned to the country in the past four years. Net migration from Bulgaria was decreasing, but “still more people leave the country than return to it”. The report said that the two main factors causing population decrease were negative growth and net migration. Between 1985 and 2016, the population of Bulgaria decreased by 1.85 million people. The study cited the National Statistical Institute as saying that more than half was due to negative natural growth – the difference between the birth rate and the mortality rate – while 48 per cent was because of net migration. The study noted that there were very different assessments and claims circulating about the number of Bulgarian citizens abroad. It presented a table of the number of Bulgaria-born people living abroad as of 2011, using sources that included Eurostat census 2011, the US Census Bureau, Turkey’s statistical institute and the Canada 2011 National Household Survey. The top 10 were Turkey 409 000, Spain 122 130, Greece 75 426, Germany 71 250, the US 65 202, the UK 48 260, Italy 43 701, Canada 30 485, Cyprus 19 284, and Belgium 18 726. The study added that as of 2016, there were 719 000 Bulgarian citizens in the countries of the EU and EEA, with the largest numbers in Germany, Spain, Greece, UK and Italy. It pointed out that not all Bulgarian citizens were born in Bulgaria. Some were from countries such as Moldova, those of the former Yugoslavia, and Ukraine, who got Bulgarian citizenship and used it to work in EU countries. Children born to Bulgarian citizens abroad also got the citizenship but had not emigrated from Bulgaria. 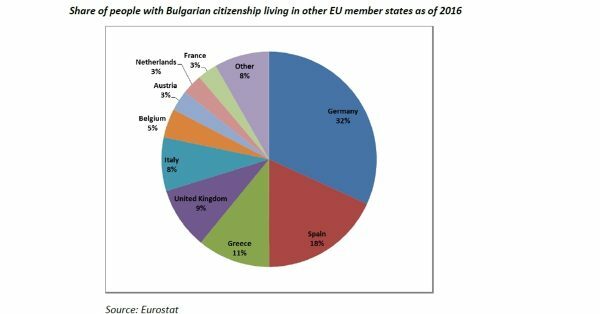 “This is the reason why the data for Bulgarian citizens, living in the EU, to a certain extent overestimate the number of those who have left the country,” the report said.